I picked up Claude in the City mainly because it looked cute, but also because it was part of Richard & Judy's Children's Book Club. It's the story of Claude, a little beret-wearing dog, and his friend Sir Bobblysock (a sock). In the first book, Claude and Sir Bobblysock go into the city and foil a robbery in an art gallery. 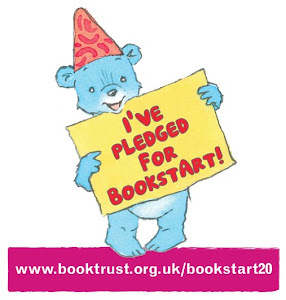 In the second part of the book, Claude takes Sir Bobblysock to hospital because he's not feeling well. Because we'd enjoyed the first book so much, I ordered Claude on Holiday straight away and we both loved this one too. 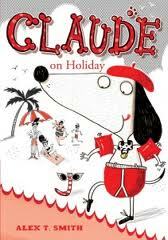 In this book Claude goes on holiday (funny that), saves a man from a shark and meets some pirates. The illustrations are fabulous and very funny. Harry particularly liked that both books heavily feature underpants and bras. There's not much funnier for a 7-year-old than underwear. When Harry saw the advert for Claude at the Circus at the back of the second book, he actually squeaked with enthusiasm. We're both really looking forward to it and I know we'll be rereading these two for a while.